Well said, Gwyn! I agree…feedback is an opportunity. I would even go a little further to say it can also be a gift! Sometimes we just don’t know it in the moment since it takes time to let go of the sting and see the opportunity or gift feedback presents to us. But I’ve been learning to embrace feedback this year – and my work is only getting better, and my marks skyrocketing. Hi Stephen ~ Thanks for being so candid. 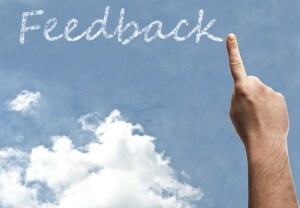 You know, we all struggle with what to do with negative feedback. I’ve found that in every piece of negative information I receive about myself, I don’t have to accept it all but I must trust that there is at least a nugget of truth somewhere in there and then do something with that. I applaud you for sticking with it and congratulate you on the success it is bringing you. I agree whole heartily that it’s a two way street. I just encountered this. My supervisor was sharing some concerns with me that I took in a not-quite-so-positive way and ended up challenging her with a counter argument. I ended up feeling better because I stood up to her and she felt defensive because she had meant well and wasn’t understanding why I was challenging her. I wonder if she had had the conversation in her head with me giving the responses SHE thought were appropriate and when I didn’t in real life, things went off the rails a bit. I know I’ve been in that spot once or twice over the years.